In a medium-size mixing bowl, combine spinach, ranch mix, mayonnaise, sour cream, bacon bits and onion. Spread the mixture onto each tortilla and roll it up. Refrigerate the rolled tortillas until ready to serve. 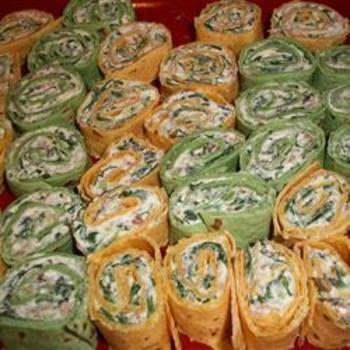 Slice each roll-up into 1 inch servings no more than 3 hours before serving.